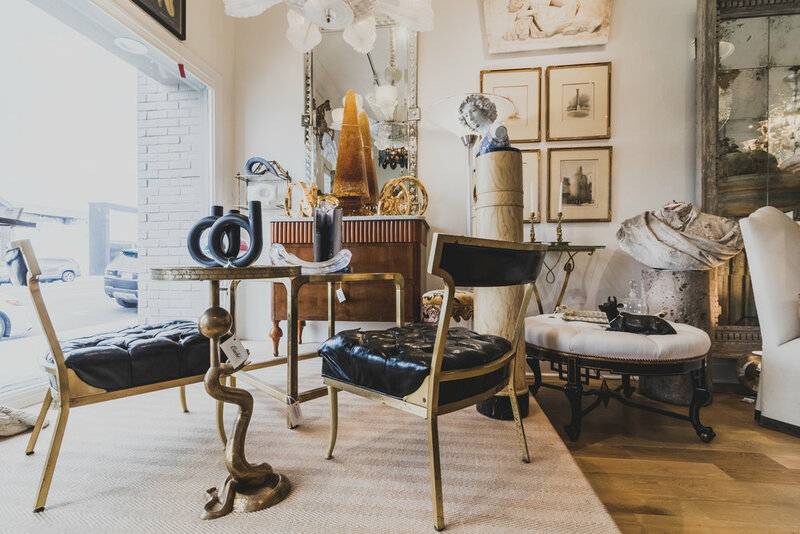 Cache Showroom is serene and approachable, and its owner, Jim, is quiet and down-to-Earth. 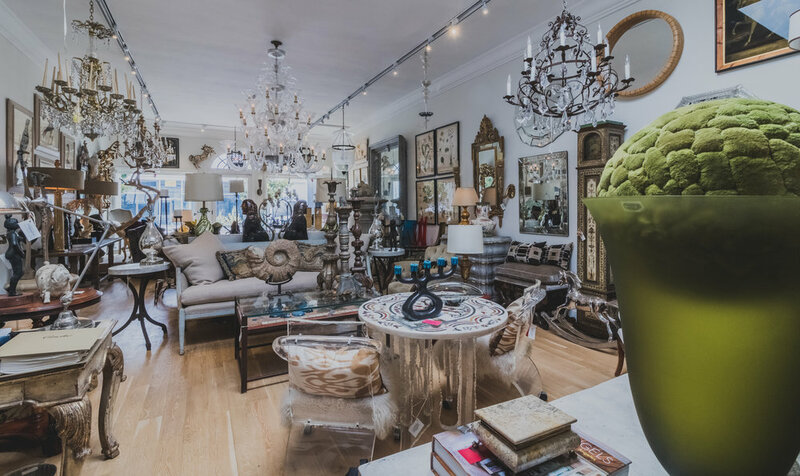 Almost the opposite of many High-Style showrooms that are also High-Energy, and often times intimidating. This serenity lends Cache a degree of elegance and luxury that doesn’t feel the need to be ostentatious to stand out. Here, the pieces (and the soft Dean Martin soundtrack), do the talking. Jim was kind enough to talk with me for a while about furniture, the DIY trend, and how much relationships between different sections of the industry have changed. Eric: Can you tell me a little bit about Cache’s history, and why it is so special? Jim: Sure, Cache has been around for about 40 years. I’ve owned it since 2003, and we just moved from our Melrose site where we were for 25 years, here to La Cienega. 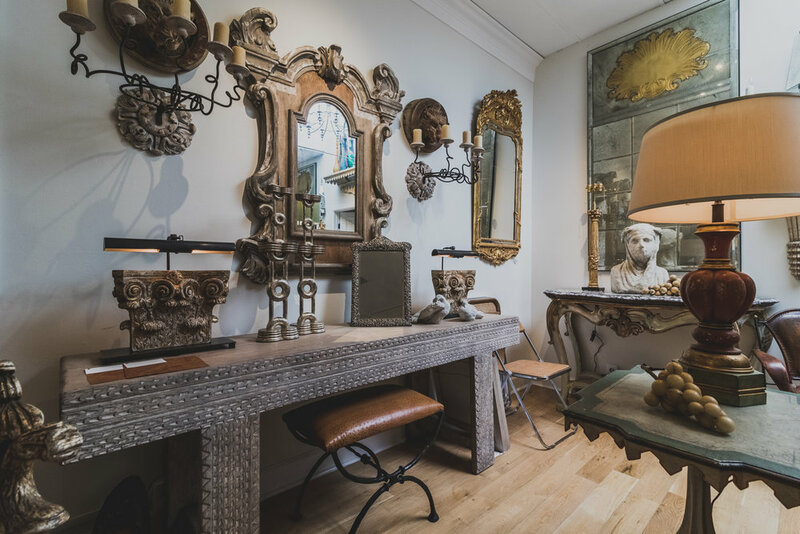 Cache, as a business, is a combination of both antiques and a full line of reproduction furniture. So, we sell sofas, case goods, other upholstered goods, chairs, stone products, metal products - it’s a full range of furniture. And the style of furniture would be considered Spanish, Italian, French, 18th and 19th century reproductions. We have some more contemporary pieces as well, so it’s not exclusively that. We are mostly for designers who are looking for high end specialty pieces, high style pieces, and then accessories. So that’s who we are in a nutshell. E: You mentioned that you bought the business in 2003, what led you wanting to buy this particular business? J: I had a small lamp business with my partner, called John James, and lamps were a great entry into the reproduction business. And rather than just grow a lighting business, I wanted to get into a full-fledged furniture option, and Cache presented itself as an opportunity. That’s the primary business, but I also do a fair amount of Interior Design through the business. E: What is it about a particular piece of furniture that makes you want to reproduce it? J: Well, for Cache as a line, people look for out-of-the-ordinary, more unique pieces of furniture. Not just: “here’s twelve dining chairs,” or “here’s a sofa for a family room.” Most of the pieces that we have and you see in the showroom are stand alone, great filler pieces. So, we’re looking for something that’s unique in style. Color combination, the medium of the product, whether it is a metal or a stone, or a combination thereof. We then take that artefact, and we try to figure out if it’s a scalable product. A lot of things from Mid-Century, or Antiques, are too small for the current market, so we scale it up. Especially for Los Angeles and Texas, where homes are out of scale. E: Where do you think the trends are heading? J: I think it’s taking a swing back to a more traditional style. I think Mid-Century, and that level of Modern has been on top for quite a few years, but every time something like that happens, it certainly appears to swing back to a traditional look. E: How has the industry changed since you bought Cache? J: I don’t think we can ignore the impact of the internet. In the 25 years that I’ve been in the business, it’s much less of a hands-on approach to purchasing. It used to be that the designer would come in with the client: touching, sitting, and feeling - making sure that it’s the aesthetic that they’re looking for. Now we’ve had to turn around and figure out how to approach a more sight-unseen option with the internet. That’s the obvious biggest change. Bricks and Mortar have also changed, although I think there is still a necessity at the high-end for people to come and sit, and touch, and feel. And I’m much more involved with Interior Designers at a design level. Customization of our furniture is probably 60% of our business now. So, they don’t just come and buy it off the floor. We all have to show tremendous value to the end user, and that’s kind of opened their eyes to what’s current or what’s going to be unique for their project. E: Can you tell me a little bit more about your Interior Designing? J: As an Interior Designer, I work with maybe two or three clients per year. Either on a full-scale level, or on a filler. A lot of times, we get retail clients coming in to the showroom who say they need these additional pieces to finish off what they didn’t finish years ago. So, from an Interior Design standpoint, I’ve met a lot of clients through my furniture relationships. And that generally leads to the next house someone does. I get very active and involved with the designer, and when the designer is comfortable with me, they bring their clients in, to make sure that we’re getting the exact furniture scheme and specification. E: What’s something the average person might be able to do to step up their Interior Design game? J: From an end user standpoint? I think the DIY world is upon us and you can’t ignore it. Consequently, as a furniture manufacturer and a showroom, we deal a lot more directly with end users. So, my advice to someone in that position is try not to bite off more than you can chew. Start with a powder room, maybe an entry-way. But don’t take on a huge project to completely re-do a house. E: Do you have any last thoughts you would like to share? J: It’s such a different world with respect to Contractors, Architects, Designers, Manufacturers, and what role we all used to play together collectively. Everybody is trying to be everything to everybody now, so hopefully there is a swing in the future to get back to what our industry was and that we can all rely on each other. E: Right, it allows more specialization and you can work harder in that one area. J: Yeah, I think we all spread ourselves really thin now trying to be everything to everybody, and you don’t have to be. There’s a lot of resources out there to help us along. E: It’s almost like a Swiss Army Knife, where it kind of does the job, but having the dedicated tools will do a better job. J: That’s an interesting analogy. That’s the thing, I’d love to see it swing back a bit. Number one, back to a little more traditional. I think everything we have in here mixes beautifully with a modern scheme. But a lot of people don’t realize that, they think Mid Century Modern has got to be purist. The thing is, and you see this a lot now, even in some of the big magazines. They’ll have a very modern home, but they’ll have pieces in it that are more traditional. Because you need that character, otherwise it just looks too sterile. We have a Florentine Mirror from the 17th Century in the front, and it should be in a Modern house! It’s probably the most High-Style piece in the showroom, but it should definitely be surrounded by a Minimalist, Modern scenario, so it becomes the focal point. So even though you are in a Modern house, here is this Roccoco-esque, 22 carat gilded mirror that doesn’t make sense, but it works. E: What a statement piece!